That’s Special: A Survival Guide to Teaching by Dan Henderson tells the story of a special education teacher who is still surviving in spite of some pretty wacky student behaviors he has faced along the way. Dan follows real stories in each chapter from this career with tools that other teachers can use to survive in difficult situations. If you click at the bottom of the page and buy the book, 10% will go back to local schools. When educators tell real stories of what students do and how they deal with it, they are often told by the listener that they should write a book. Dan Henderson is one of those teachers who followed through. In addition to helping rookie and veteran teachers alike, this book will help parents understand what teachers have to deal with when faced by troubled students. In Dan’s case he was given the most troubled and thanks to his persistence and some trial and error, he is still surviving. The special children Dan deals with are the one’s who have not fully accepted social behavioral norms. While most are eventually classified for special education services, some are not. The trick is to socialize these students so they can learn and prosper rather than dropping out or being suspended. While Dan’s experience is limited to elementary school, I can assure you that much of it certainly applies to older students as well. Each of the ten chapters starts with a real story about a student Dan has worked with. While they can tear at your heart, Dan tries to see the humorous sides of their stories. When I dealt with difficult kids I tended to do the same thing, and I know it helped me survive. 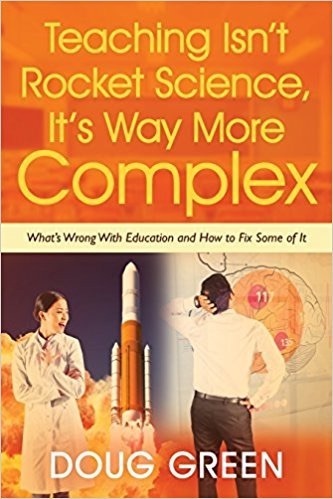 I can fully relate to Dan’s stories as I was a principal in a school where 20% of the students received special education services and many exhibited behaviors that would make them candidates for this book. Following the stories, Dan offers what he calls tools. This is advice will help teachers deal with and prevent the kind of behaviors described in his stories as they promote their own sanity and survival. Tool 1 Conduct a student survey. This is perhaps my favorite tool. It suggests that you start the year by conducting a student survey. The goal is to find out as much as you can about a student like their interests, what they like about school, and what they don’t like. If possible find out what makes them angry and how they calm themselves down. Dan offers some specific questions you can use. Tool 2: Create a Behavior Management System. Dan recommends that rather than taking something away that you refuse to give them something. For these kids it is essential to take breaks that feature physical movement. (Doug: I’ve posted many pieces of advice along this same line.) Like others, Dan knows that exercise will improve mental performance. When you threaten consequences, you must follow through, but you also need to give kids a chance to redeem themselves. This allows a chance for self-regulation. Try to reinforce positive behavior and let students know that what they do is their choice. Tool 3: Build Routines and Respond to Needs. Dan believes that routines are important for the students he serves. He also has a system, which includes a request box, that allows students to let him know what their needs are. He even has an emergency signal for students to use. Needless to say, the routine allows for lots of movement and brain breaks and this type of student needs routines. Tool 4: Positive Reinforcement: Here Dan gives eight methods he uses. You might not agree with all of them, but I’m sure you will find some good ideas here. Tool 5: Tracking Data: Teachers need to keep track of what students know and can do. Dan recommends pretests so you know where students are starting. Your data sheets should be organized by standards. There is no mention of state test data here which makes sense as I don’t find it very useful. Tool 6: Creating Centers or Stations: Centers allow kids to move and can be rigged to differentiate instruction. They also allow more time for individual and small group instruction. Technology can be involved here with computer activities, assessment, and direct instruction via videos. Tool 7: Differentiate Your Instruction: This is the holy grail for teachers. Ideally each student gets instruction at their own level. In addition to his centers, Dan gives many ideas here about how to reach this goal including multiple lesson plans or multiple approaches within the same lesson. Tool 8: Check for Understanding: If you lose a student early on, the rest of what you do is not likely to succeed. As you find out which students understand each item, it will inform your efforts to differentiate as you move forward. It is also necessary to know which students have the necessary prerequisite skills and knowledge. Tool 9: Higher-Order Thinking: Just because students have a special education tag doesn’t mean they can’t engage in real thinking. Open-ended questions can help. Projects can elicit thinking as well. In some cases letting students to work on projects together works. Tool 10: Make Your Lessons Fun! Look for good learning games and try to inject music when possible. Real-world connections can also make things fun and interesting. Make sure that students believe that their intelligence is not fixed and that you care about them personally. Be sure that the students’ best work is on display in school and on the classroom blog. If you were considering a career in teaching special education students and read Dan’s stories, you might think twice. After reading about his tools, however, you should see how it can be a rewarding option thanks to his tools and your own hard work and caring. If you know anyone working with these types of students or considering it, see that they get a copy of this book. This entry was posted on Tuesday, November 3rd, 2015 at 7:35 am	and is filed under Book Summaries, Education Books, Leadership Books. You can follow any responses to this entry through the RSS 2.0 feed. You can leave a response, or trackback from your own site.